Well, this guy sure went and showed Lucas! Not only has he permanently etched a tribute to arguably one of the most-terrible TV specials of all time, but he’s done it with reference to one of the most terrible features of that terrible TV special: Chewbacca’s unnervingly-domesticated and -dorky Wookiee family. In your face, Lucas! This guy definitely showed you and coincidentally doesn’t look like a short-sighted moron at all! Via Force in the Flesh, who has nothing against morons, as long as they’re sporting 20/20 vision. It’s a fitting choice though. 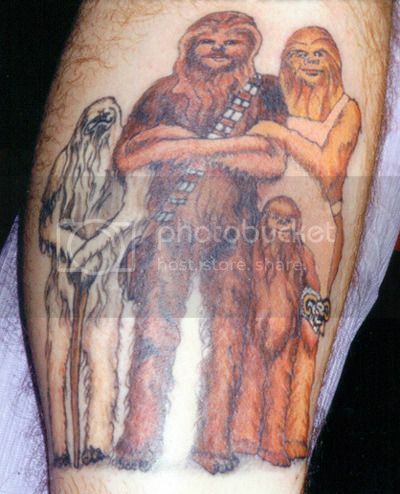 Once the leg hair grows back over that area, Chewie’s family will have the added textural realism.